Display specialist, Hannspree, is expanding its HannsG HT Touch Screen monitor series with the addition of a new tough, multifunctional model. 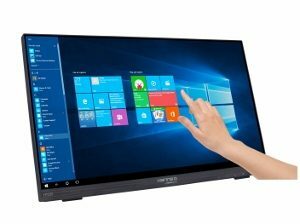 The 21.5” HT225HPB, which boasts: industry leading 10-point touch performance optimized for Windows 8 and 10, IPS display technology for super wide viewing angles and a triple input interface for versatile connectivity, also features a tough scratch resistant screen specially designed to withstand the rigors associated with touch activities. Ideal for education institutions, retail and industrial applications as well as the home and office the multifunctional HT225HPB includes a 7H hardness rated glass screen which extends edge to edge providing total protection from impact, scratches and dirt. The glass overlay covering the screen provides durability without effecting touch performance providing a long term consumer and commercial solution capable of delivering the perfect touch experience for the most demanding interactive applications, including; interactive digital signage, in-store retail display, gaming and amusement, point of sale terminals, interactive kiosks and much more. The new HannsG HT225HPB by Hannspree includes advanced 10-point projected capacitive touch control which not only promises a high end multi-touch experience with super fast, sensitive touch response and excellent dragging performance, but also allows multiple user screen interaction. Combined with the HT225HPB’s Full HD Credentials, the inclusion of HannsG’s proprietary active contrast colour enhancing technology, and IPS display technology delivering 178° viewing angles and minimized colour shift on both horizontal and vertical planes for the most comfortable, accurate viewing experience, the new HannsG HT monitor can unlock the power of today’s touch-enabled applications whilst users enjoy the most professional picture display. In order to fully appreciate touch screen capabilities the HT225HPB features a “Book” type smart adjustable stand. 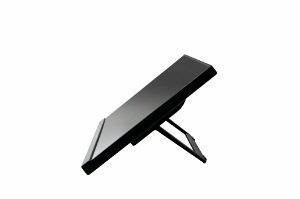 This ergonomic, sliding – tilt and robust stand enables the monitor to withstand the downward force of touch actions whilst providing the best perspective for viewing and comfortable touch usage. The HT225HPB’s cleverly constructed modern design is also VESA wall mount ready to support an eye level touch experience as well as making it more convenient to place in locations where space is at a premium. Featuring a triple input interface, the HT225HPB includes a traditional VGA port, a HDMI port for Full HD content transmission and a versatile DisplayPort. The comprehensive input line up ensures that the HT225HPB is compatible and ready to partner with a wide range of external hardware and deliver the most demanding content in true form. Also on-board are two stereo speakers supplying clear, immersive audio, removing the need for external speakers.